Prune Azaleas in May-June. 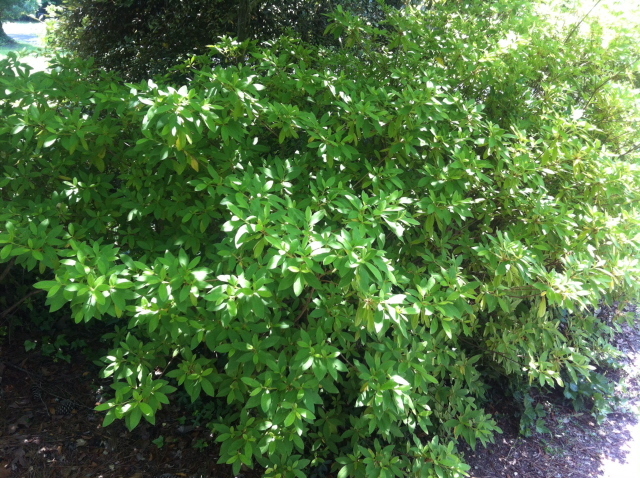 Fertilize Azaleas, Avoid and Kill Poison Ivy – Johntheplantman's stories, musings, and gardening. 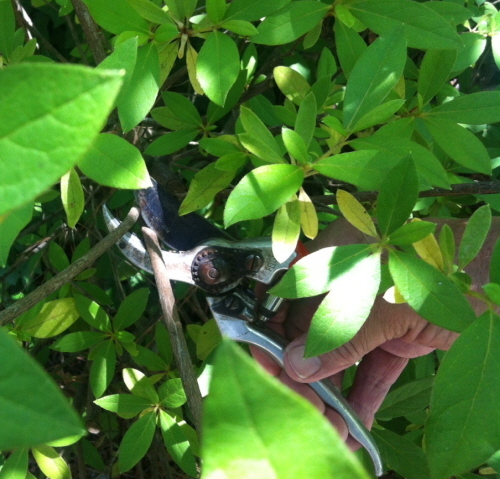 There’s a reason for pruning azaleas the first week of June, too. One of my fun mental exercises for years has been to listen to the old people’s comments on growing plants and then to figure out why their techniques work. 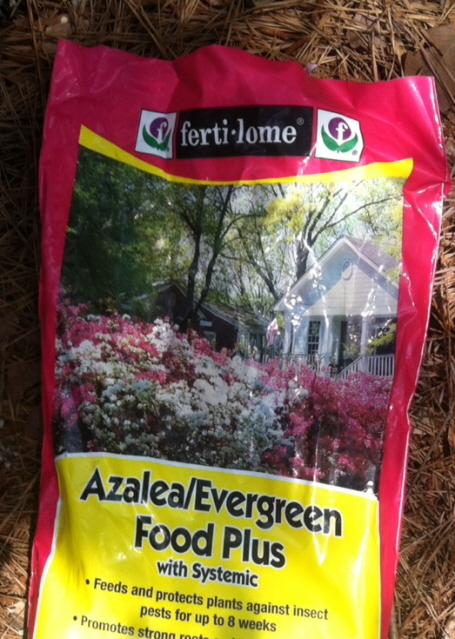 Please note that Encore azaleas are treated differently. 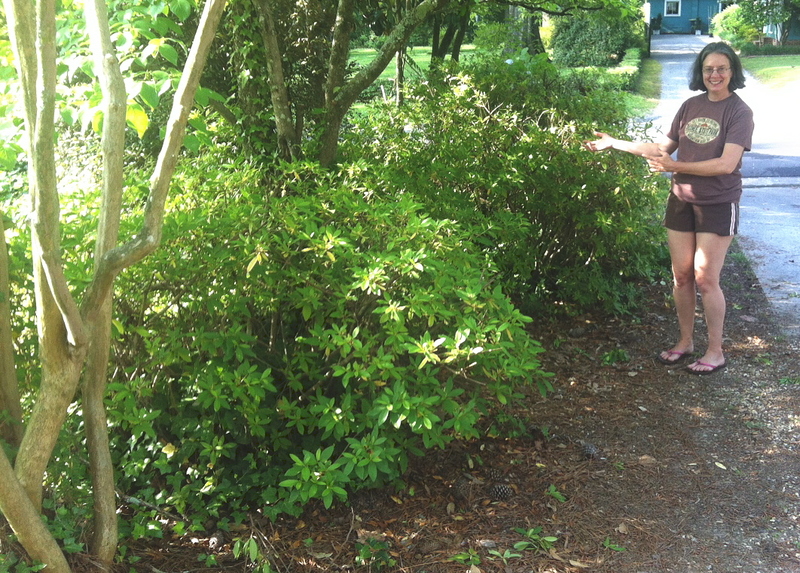 As for the time to prune azaleas, it’s interesting. In June, the plants have finished blooming and are entering their peak growth stages. The azalea will set its bloom for the following spring in August. The blooms are commonly borne on the growth tips and pruning at the right time increases the number of tips so that you will end up with a more compact plant and many more blooms. You may wish to read my article on Pruning as an Art Form for a concise description of what happens when you prune a plant. One of my goals is to open up the plant canopy to allow more light to reach the inside. This will promote lower growth which will strengthen the plant. I try to keep the sides of the plant neat and pretty but I never hesitate to open up a “hole” in the top. New growth will fill this in rather quickly. I’m a little over six feet tall and this plant was a bit taller than that. I try to watch for danger when I’m working in overgrown shrubbery and my diligence paid off this time. As I worked, a giant poison ivy vine was sneaking up on me. I saw it just in time and backed up. I planned to approach it slowly and carefully. 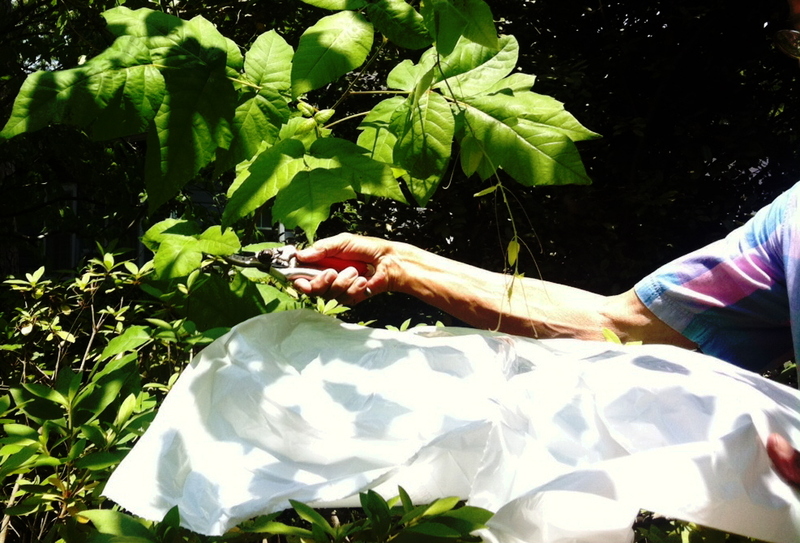 The only really good way to get rid of poison ivy is to spray it but I don’t want to get any spray on the azalea so I placed a garbage bag over the azalea and carefully moved the poison ivy stem on top of it. Using a generic form of Roundup with glyphosphate as the active ingredient, I sprayed the tip of the plant. 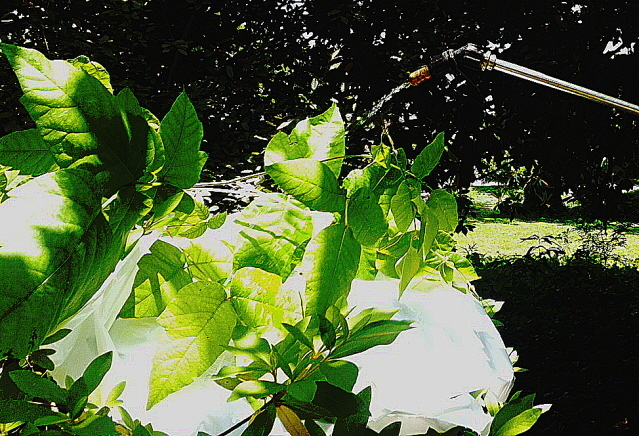 The chemical will enter the system of the plant and should move on down the stem and kill the roots. Spray with very low pressure to cover weed but to not get it on the good plant. And here’s the “after” picture. Remember what I always say—“Happy Wife, Happy Life.” Now she will be free to find something else to remind me to do. 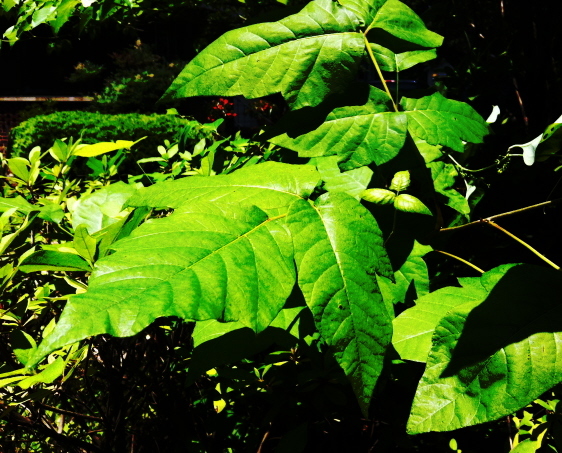 Great tip for avoiding the spray on the good plant while treating the poison ivy. 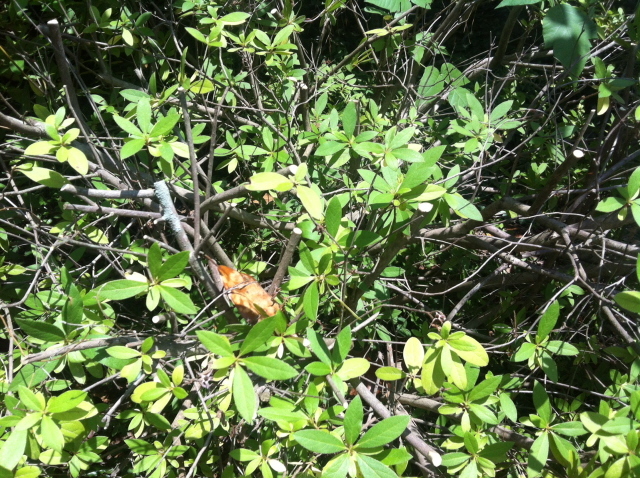 Maybe one of your future posts could tell how to get rid of briars growing up inside azalea bushes. I’m afraid to poison for fear of killing my azaleas.